Our neighborhood has some serious Halloween fans and the yard decorations get bigger (and some might say scarier) every year. In the past few weeks I’ve discovered that Sasha is no fan of skeletons rising from the ground, or ghostly wraiths swinging in the trees. She mutters past the tombstones propped in flower beds, skitters away from cobweb-shrouded bushes, and barks wildly at the assorted inflatable creatures that have taken possession of the lawns. In contrast, my beloved spaniel Alix loved Halloween and was first to the door (followed closely by the two cats) whenever the costumed hordes rang the bell. Before giving out the goodies we’d ask her “Shall we give them candy?” and time after time she obliged with a single happy bark. This became a neighborhood tradition and every year the kiddies waited eagerly for the dog’s seal of approval. Glow sticks aside, I’m fairly confident that Sasha won’t enjoy a night of endless bell-ringing and kiddie chatter. So we’ll go dark and retreat to the rear of the house with a pet-friendly movie and extra treats for our own four-legged kiddies. With all the candy and decorations associated with Halloween, you have to be extra careful. Many candies, snacks, and decorations can be tempting, but dangerous, for your canine pal. Make sure to pay close attention to your dog during this festive time. 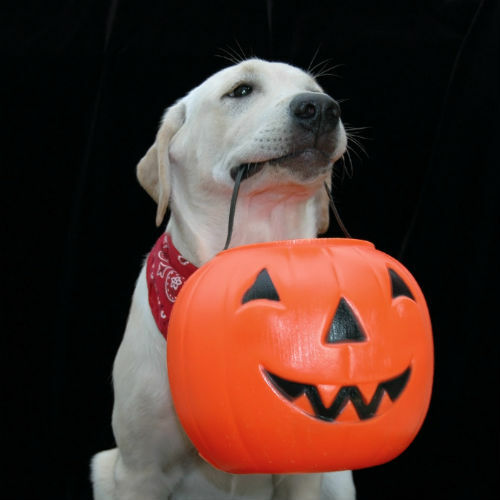 Check out our list of items to keep away from your dog during Halloween. And we’ve got your general safety tips, too! Read those here. 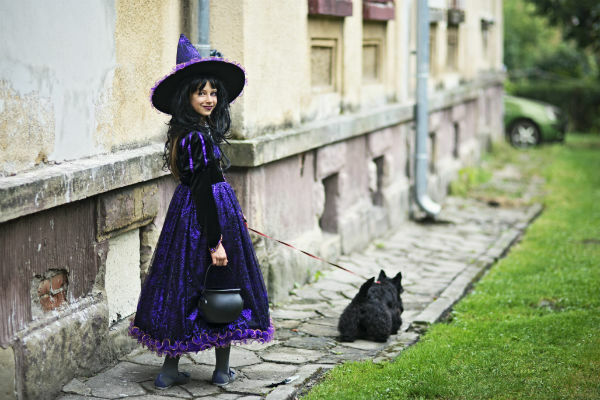 Is your dog going trick-or-treating with the family? You’ll want to make sure he’s OK with all the Halloween chaos before you decide to bring him with you. If you do take him along, you’ll want to take certain precautions to stay safe while you’re going house to house. 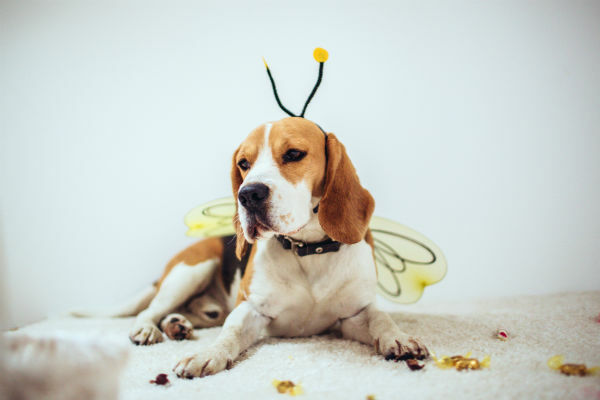 This article will help you decide if your dog should come trick-or-treating and learn some tips on how to stay safe on the big night. With Halloween come trick-or-treaters. If kids are going to be ringing your doorbell, you’ll want to make sure your dog is prepared. Check out these best practices for making your dog part of the Halloween greeting committee. You think it will never happen, but with a crazy night like Halloween your dog might get away from you. Learn what to do should he get away here. Similarly, if your dog ends up lost, you’ll need a plan to jump into action and get him back home. Check out our tips here.